Nashville Preds mascot Gnash and the AMEND Together kids. NASHVILLE, Tenn. (March 30, 2018) – With just a handful of games left in the regular season and a Stanley Cup Playoff bid already clinched, the Nashville Predators took some time off the ice to raise awareness and end the epidemic of violence against women. Several players were featured in a public service announcement that promotes healthy masculinity and condones violence against women. 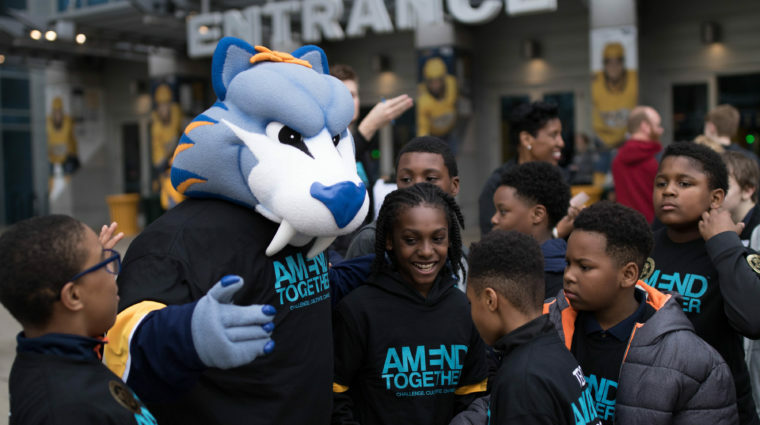 The video premiered on March 29 when the Preds took on the San Jose Sharks in the second annual AMEND Together Night with the Preds. AMEND Together (formerly MEND) is a program of YWCA Nashville & Middle Tennessee dedicated to ending violence against women by engaging and educating men and boys. The Nashville Predators Foundation last year announced a $500,000 donation to the community-based prevention program. The Allstate Foundation Purple Purse is also investing significant resources to ensure the program’s success. A recently announced $200,000 Purple Purse grant will be used for engaging and educating hundreds of boys in Metro Nashville Public Schools through AMEND Together clubs. It will also allow the YWCA to reach thousands of men across Nashville and the nation through the faith-based clergy curriculum “AMENDing through Faith” and the annual AMEND Together Experience. A multi-year public awareness and engagement campaign is planned to support this effort. Nearly 100 students from the YWCA’s AMEND clubs attended the March 29 game. Fans at the game learned more about the epidemic of violence against women and how to get involved in the AMEND Together initiative. The Nashville Predators recognize they play an important role in the community beyond what takes place on the ice. Established on August 18, 1998, the Predators Foundation strives to meet the educational, social, health and cultural needs of the community by offering unique resources and financial support to local youth-oriented organizations, awarding almost $5 million to the greater Nashville community. Between grants and other charitable donations, such as player ticket programs and fund-raising efforts, the Foundation donated over $1 million in cash to community organizations during the 2016-17 season. To learn more about the Nashville Predators Foundation and see a list of upcoming events, visit www.nashvillepredators.com/foundation. Allstate Foundation Purple Purse is the longest-running national campaign focused on ending domestic violence through a proven solution: financial empowerment services for survivors. The Allstate Foundation offers a free comprehensive financial literacy tool designed specifically for survivors, The Moving Ahead Through Financial Management curriculum, on PurplePurse.com. For 120 years, YWCA Nashville & Middle Tennessee has helped women, girls and families in Nashville and Middle Tennessee build safer, more self-sufficient lives. YWCA is dedicated to eliminating racism, empowering women and promoting peace, justice, freedom and dignity for all. Programs include Domestic Violence Services, Girls Inc., AMEND Together, j k livin, Dress for Success Nashville, and the Family Literacy Center. For more information, visit www.ywcanashville.com, follow us on twitter @YWCANashville and find us on Facebook facebook.com/YWCANashville.